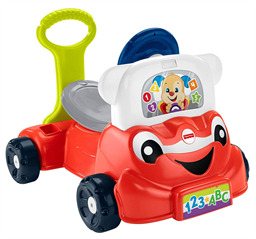 The Fisher-Price Laugh & Learn 3-in-1 Smart Car is an interactive car for infants, and preschoolers that grows with your child. It features lights, and sounds that offer multiple ways to play. Featuring Smart Stages technology, the car has three levels to choose from: Level 1- Explore, Level 2- Encourage, and Level 3- Pretend. Each level has fun songs, and phrases that introduce the alphabet, opposites, counting, shapes, Spanish words, and more. The light-up dashboard offers a variety of car related activities like turning the key, pretend steering, and honking the horn. There's also a radio, and phone. In addition to learning and pretend play, the Smart Car is a great way to work on Gross Motor skills. 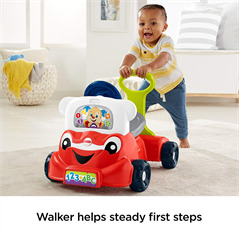 It starts as a walker with a handle for infants and toddlers to hold while taking their first steps. When they're able to sit and balance, it becomes a stationary, sit-on bouncer. Finally, it becomes a cruiser for scooting around. Phrases, and sounds encourage kids to keep moving. Three AAA batteries are included, and it has a weight limit of 42 lbs. 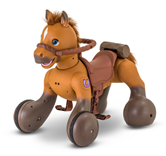 This is a really great toy that's well designed, and reasonably priced. It features fun bright graphics, and learning content for infants, toddlers, and preschoolers. It's also a great way to work on gross motor skills transforming from a walker to a stationary, sit-on bouncer to a cruiser. 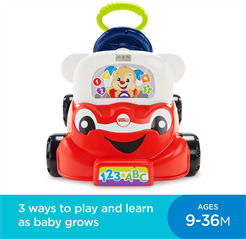 The Laugh & Learn 3-in-1 Smart Car was designed for infants, toddlers, and preschoolers ages 9 months - 3 years old. It's a fun option for boys or girls. The car has a weight limit of 42 lbs. This smart car features Smart Stages technology with three levels to choose from. 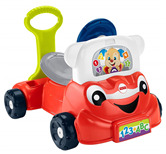 The car features a number of activities including a phone, which activates playful songs, and phrases. Kids can even call the Laugh & Learn Smart Learning Home from the pretend phone by pressing the car phone button to "call home" and hear the Laugh & Learn Smart Learning Home respond. The Home is sold separately. Three AAA batteries are included. The car has a weight limit of 42 lbs. This learning ride-on from Fisher-Price can take a 9-month-old niece or nephew from their first steps, to bouncing while learning, through taking their Laugh & Learn 3-in-1 Smart Car for a spin! That's a of learning and development for around $40!